We've heard about some of these incidents and perhaps seen one or two headlines about this in the news, but now it's official. 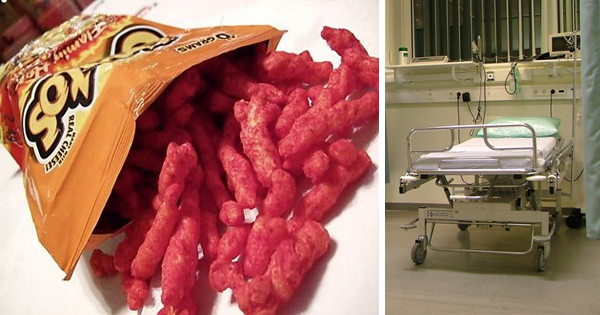 Doctors are taking issue with Flamin' Hot Cheetos. Here's why. The marketing for Flamin' Hot Cheetos is incredibly accurate. This cheesy snack is "dangerously good." So dangerous, in fact, many doctors are now advising parents to not let their children — and to not let themselves! — indulge in this fiery, cheesy snack. Overindulging can, in fact, put you in the hospital from the side effects. Dr. Kathleen Berchelmann from St. Louis Children's Hospital explains that Flamin' Hot Cheetos are made with just the right amounts of salt, saturated fats, and sugar that make the food incredibly addicting. People who have good self-control already struggle to put the bag away. Children with even less, or no, control at all, tend to finish the entire bag. This isn't unhealthy just because it's bad to eat that much processed foods or fats. Eating this much Flamin' Hot Cheetos in particular is bad for your health because all the red hot spices you ingest can actually damage your stomach. The spices from the Cheetos can stick along your gastrointestinal tract — including your esophagus, stomach, duodenum, and small intestine. This can cause pain in the upper abdomen that rises to the chest, "likely due to the red peppers and spice contained in the snack," Dr. Glatter explained. Dr. Glatter serves as an emergency medicine physician in New York. For other patients — including children — eating a large amount of Flamin' Hot Cheetos can cause stools to turn red from the red dye. Parents and children alike assume that the redness in the stool is blood, which then prompts them to visit the emergency room out of panic. Although red stools don't necessarily warrant a panicked response, the change in color does suggest that you've eaten way too many Flamin' Hot Cheetos. It takes more than just a small amount of food dye to actually change the color of your stool. Next time, when you find yourself tempted to eat an entire bag of Flamin' Hot Cheetos, try to refrain. Your body will thank you for it.